Argumentation is the interdisciplinary study of how conclusions can be reached through the construction and evaluation of arguments, that is, structures describing a proposition together with the reasons for accepting it. The field has received growing interest within Artificial Intelligence over the last decades. It covers aspects of knowledge representation and multi-agent systems, but also touches on various philosophical questions. Phan Minh Dung's abstract argumentation frameworks (AFs) play a dominant role in the field. In AFs arguments and attacks among them are treated as primitives, i.e. the internal structure of arguments is not considered. The major focus is on resolving conflicts. To this end a variety of semantics have been defined, each of them specifying acceptable sets of arguments, so-called extensions, in a particular way. This book is mainly concerned with the investigation of metalogical properties of Dung's abstract theory. In particular, we provide cardinality, monotonicity and splitting results as well as characterization theorems for equivalence notions. The established results have theoretical and practical gains. On the one hand, they yield deeper theoretical insights into how this nonmonotonic theory works, and on the other the obtained results can be used to refine existing algorithms or even give rise to new computational procedures. 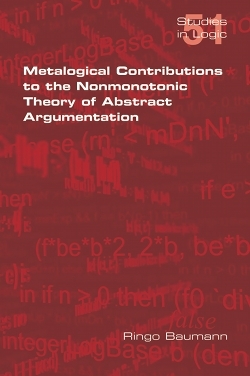 A further main part is the study of problems regarding dynamic aspects of abstract argumentation. Most noteworthy we solve the so-called enforcing and the more general minimal change problem for a huge number of semantics.